The 101st Regiment Leaving for Training, Edmonton, AB, September 1914. 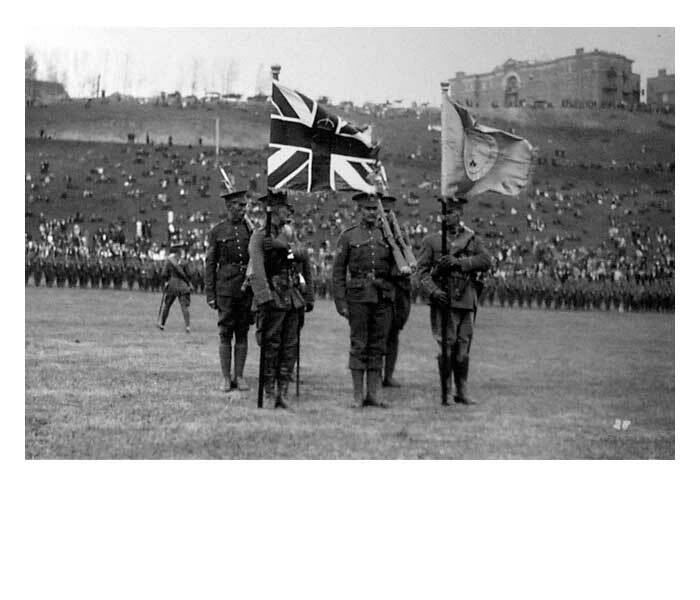 Due to the reorganization of the Canadian Expeditionary Force, the 101st Battalion was broken up. Upon arriving at the military training centre at Valcartier, Quebec, the men of the 101st were integrated into the new 9th Battalion. In late 1914, W.A. Griesbach was charged with the task of commanding and helping to raise an Edmonton regiment. The new regiment, the 49th Battalion, would have the opportunity to represent Edmonton on the battlefields of Europe. Whether or not Sam Hughes realized the weaknesses of his arrangements for the 1st Division of the Canadian Expeditionary Force, superficial changes were at least introduced when a second contingent was announced in October. This time recruiting and organization were to be carried out locally. 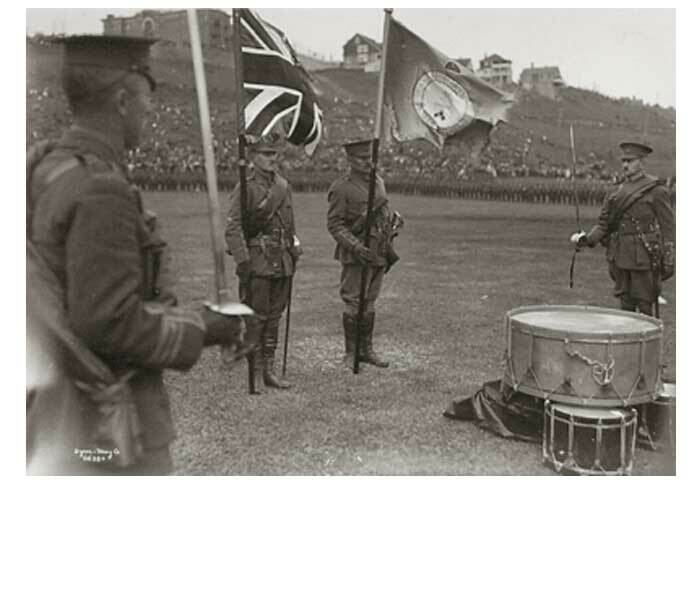 Although Edmonton still did not get its own regiment-Alberta was allocated only one battalion, the 31st, which went to Calgary-hope for the future did exist. In November, several hundred recruits from Edmonton went south to Calgary to enlist in the 31st Battalion. Then, on 1 December, both Edmonton newspapers ran front-page stories announcing that W.A. Griesbach was returning to the city to command a new regiment. Griesbach had hardly arrived in England with the Dragoons when he was offered one of the new infantry regiments being planned. Unlike many cavalrymen of the day, Griesbach immediately grasped the reality that the horse would have no place on the battlefields of Flanders, and he accepted the offer without hesitation. In the four months since the beginning of the war, Edmonton had already sent about 2,400 men to serve in the CEF. Initially, these soldiers had disappeared into the anonymity of the new numbered battalions, but the city now appeared on the verge of acquiring its own active service unit. With Sam Hughes at the helm, however, things were never as straightforward as they first appeared. If a modern centralized depot had been in place to provide in the first instance basic training and then a steady flow of trained reinforcements for front line battalions, recruiting units locally would have been entirely reasonable and desirable. The professional soldiers on Hughes' staff were urging him to create such a system, but he consistently refused. (23) The patriotic enthusiasm and courage of the volunteers made extensive training, in Hughes' eyes, unnecessary. The result was that battalions were recruited and shipped off to England before they were ready to go into the line. The consequence of their manifest lack of preparation was that most of the battalions were broken up for reinforcements. Enlisting at Calgary for the 56th Battalion 9 October 1915. Minister of Militia and Defence Sam Hughes believed that the patriotic fervour and courage of new recruits would compensate for a lack of basic training. In reality, the insufficient preparation of battalions comprised of new recruits severely limited the manner in which they could be used. Upon arriving in England, they were often broken up for reinforcements. Other difficulties were also associated with Hughes' recruiting methods. Just after Christmas, the newly promoted Lieutenant-Colonel Griesbach arrived in Edmonton to begin recruiting his 49th Battalion. By this time, however, another new unit, the 51st, had also been authorized. To simultaneously recruit two new infantry battalions in a city of less than 50,000 people, could only lead to further confusion and destructive competition. Griesbach complained to Hughes but without effect. Griesbach's situation was particularly difficult as the 51st had rather closer ties to Edmonton's pre-war militia infantry. Its commanding officer, Lieutenant-Colonel R. de Lotbiniere Harwood, had been CO of the 101st and brought a number of his officers with him into the new regiment. Although no one knew it at the time, one of these new battalions would become part of the front line forces of the Canadian Corps while the other would be relegated to service as a replacement battalion. The determining factor that decided which one would emerge as the embodiment of the contributions of Edmonton and northern Alberta to the war effort was unquestionably the personality of W.A. Griesbach. The CEF was rapidly evolving into a huge organization of hundreds of thousands of soldiers, but, in 1914 and early 1915, plenty of scope still existed for individuals to exercise a decisive influence. Technically the 49th was part of the new and inevitably bureaucratized wartime army. On the ground in Edmonton, however, it was as much "Billy" Griesbach's regiment as the PPCLI was Hamilton Gault's. 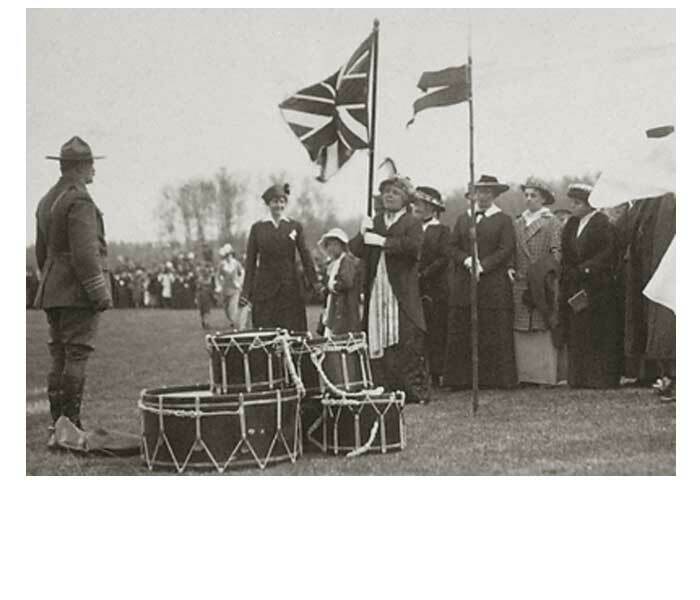 The 49th Battalion adopted the "Bonnie Dundee" as the regiment's song largely because of the enlistment in 1915 of a company of Scots soldiers. Since both regiments began recruiting the same day, the process inevitably turned into something of a contest to see which one could reach full strength fastest. This was of crucial importance because, under the existing scheme, the difference in the quality of training was substantial. In the words of Sam Hughes' biographer, "The first man to enlist trained most, the last man hardly at all." (24) This was especially true in Edmonton in 1915 because the new battalions would have to build their own accommodations and training facilities. Within a few days, the fact that the 49th would easily win the race to sign up the full complement was readily apparent. The Scottish group that had been trying to organize a highland regiment enlisted as a company, complete with pipe band, on the first day of recruiting. The regiment's immediate success was one of the reasons, no doubt, that it adopted the tune "Bonnie Dundee" as its quick march. Ten days after recruiting began, the 49th had reached 790 men while the 51st had 431. This advantage was gained in spite of the fact that the two regiments agreed to divide the surrounding rural areas for recruiting purposes. In theory, at least, the division should have benefited the 51st rather than the 49th. The former received the more heavily populated and easily accessible districts to the east of Edmonton while the latter drew on the more remote north and west. By the time Griesbach announced that the 49th had reached full complement on 21 January 1915, men from both regiments were at work converting the exhibition grounds to a military base. In the meantime, while the men were billeted at various places, city council donated free streetcar tickets to get them back and forth. After a month of work, the buildings were ready and training could begin in earnest. By April, the 49th was nearing readiness and, in the middle of the month, put on a display of drill at the annual Spring Horse Show. On 1 May, an ominous announcement came from Ottawa. Both the 49th and the 51st were to provide a reinforcement draft of 253 officers and men. Losing a full company of their best-trained men would put back readiness indefinitely and threatened to relegate the battalions to permanent replacement units. This had been the fate of the 101st, and neither battalion desired a similar destiny. Both commanding officers protested, and city council debated a motion to send a letter supporting their position. 49ers Depart for Europe, 1915. Soldiers of the 49th Battalion bid farewell to family, friends, and well-wishers who are seeing them off to Europe and active duty in the First World War. The protests seem to have had some effect. A week later, the orders for the draft from the 49th were cancelled and plans for its imminent departure for England were confirmed. (25) The 51st was less fortunate, its orders to give up the reinforcement draft stood and the battalion was still trying to make up its numbers two months later. The factors that tipped the balance in favour of the 49th are difficult to determine. Griesbach's Conservative political ties probably helped; he had run unsuccessfully against Frank Oliver as a Tory candidate in the 1911 federal election. But Griesbach was no great admirer of his fellow Conservative, Sam Hughes, and the coolness was mutual. In all probability, Griesbach had simply done a better job of training his battalion, and they showed up at a higher state of readiness at the inspections carried out in the spring of 1915. On 11 May, the Lieutenant-Governor reviewed both regiments and presented them with their colours, which had been embroidered by the women of the Borden Club. The following day, an announcement was made that the 49th would leave for England in a few days while the 51st would go to Calgary for further training. (26) On 29 May, the 49th quietly boarded two special trains and left on the long journey to Flanders. Ceremony and publicity had marked earlier departures from Edmonton, but the war was now a much grimmer and more serious business. Long daily casualty lists in the newspapers had served to temper initial public optimism about the conflict. Fairly realistic concern also existed about German saboteurs slipping across the border from the neutral United States to blow up railway tracks and bridges. A German agent in February managed to dynamite a Canadian Pacific Railway bridge at Vanceboro, Maine, and the German embassy had more ambitious, although unrealistic, plans in the works. (27) The Edmonton public did not learn of the regiment's departure until 2 June when the Bulletin published a letter from Griesbach entitled "Somewhere in Saskatchewan." In the letter, Griesbach thanked the city for its hospitality during training and apologized for the necessity to keep the departure secret for security reasons. colours to the 49th and 51st battalions. thousands of soldiers and spectators look on. 49th and 51st battalions stand ready after being presented with colours. the elaborate colour presentation ceremony. 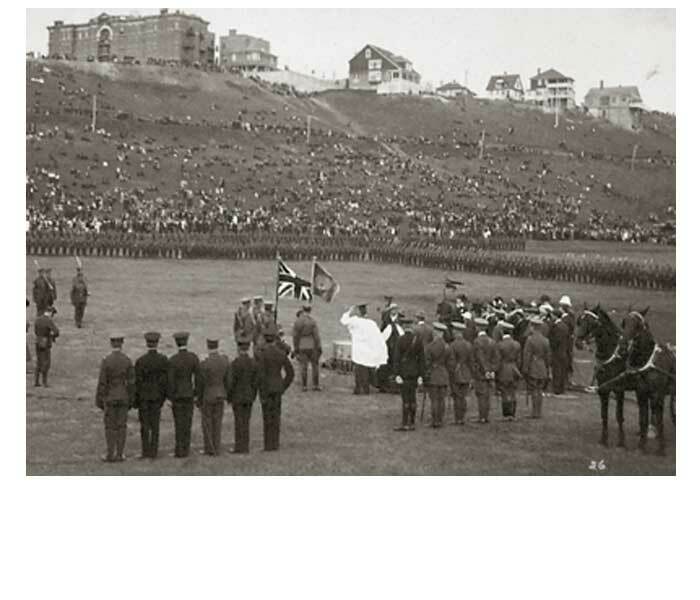 Presentation of Regimental Colours, Edmonton, AB, 11 May 1915. On 11 May, the Lieutenant-Governor of Alberta reviewed the 49th and the 51st regiments and presented them with their colours. The next day, the 49ers left for England and active duty. 23. Haycock, Sam Hughes, p. 203. 25. Edmonton Bulletin, 7 May 1915. 26. Ibid., 12 May 1915. 27. Martin Kitchen, "The German Invasion of Canada in the First World War," International History Review 7 (1985): pp. 245-260. 28. Edmonton Bulletin, 10 June 1915.